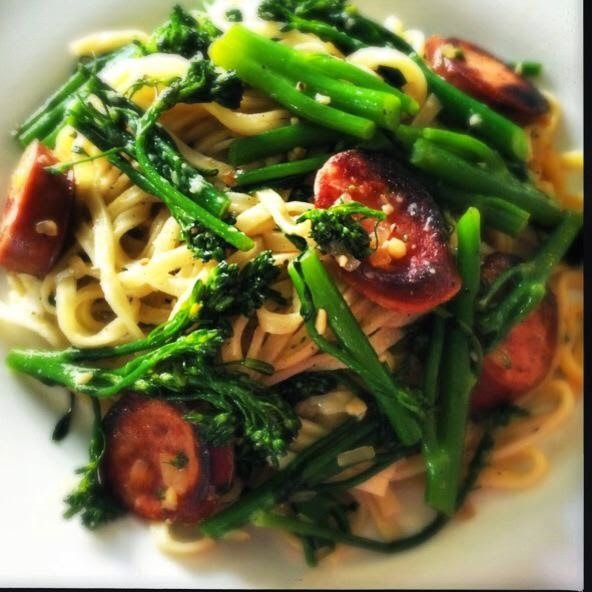 Sauteed Broccolini with Polish Sausage, and Fresh Linguini on Day 2 at North Market! Anyway, as I have mentioned, I was on a food adventure this past weekend in Columbus, OH. My road trip buddy and I came across this FANTASIC market on Spruce Street, known as North Market. It was packed full of wonderful, locally owned, and operated, organic certified, restaurants, merchants, and artisan food craftsmen. It was truly a sight to behold. I spent two days there, and barely scratched the surface. I have never been so inspired by ingredients in all my life and I have enjoyed cooking with them and sharing my recipes with you this week! Today's main ingredient came from a great vegetable stand, centrally located as you walk through the doors called The Green Grocer. rainbow of freshness! You can actually SEE the difference organic makes! I mean, look at these tomatoes. So much to choose from, but keeping in the spirit of the trip, I chose an ingredient that I have read a lot about, but have never seen in my local grocery store. Broccolini. and met up with my sister, and my ADORABLE nephew Rylan! After lunch I headed over to Hubert's Polish Kitchen for some of their fresh Polish Sausage, and to Sarefino's Pastaria for some great, fresh linguini. Then it was home to my kitchen to whip up a delectable spring time dish and I can't wait to share with you! So I know what you may be thinking. "What on Earth is broccolini?" Delicate like asparagus, but tastes just like broccoli. sauté asparagus or broccoli. I will blanch it first, to tender it up a little. You start by bringing a pot of water to a boil, and add salt. Once boiling, add your broccolini. You are going to let is cook 2-3 minutes. 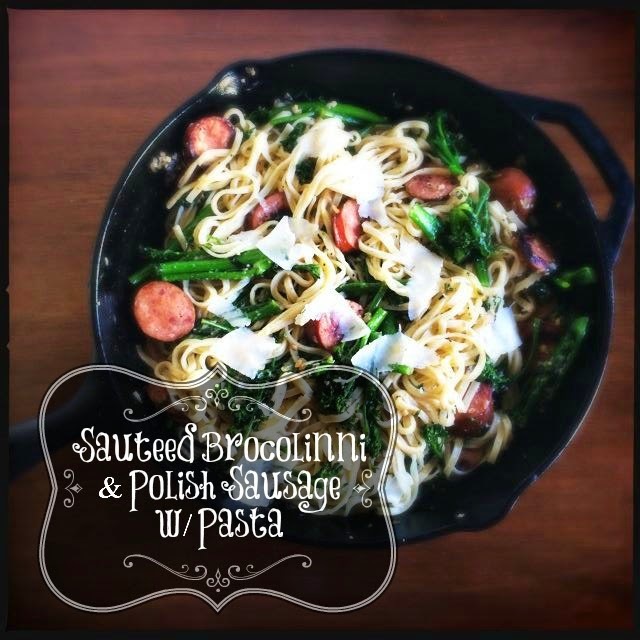 While that's happening, go ahead and start browning the polish sausage in your skillet. broccolini from the pot (DO NOT EMPTY THE WATER) and add to the bowl of ice water. Brown sausage on both sides and remove from pan. so I decided to cut it into more manageable pieces. To my hot skillet, I added the oil and onion. Let that cook until soft and translucent. Can we just take a moment to look at this beautiful, fresh pasta. Now you will add your pasta to your pot of boiling water. 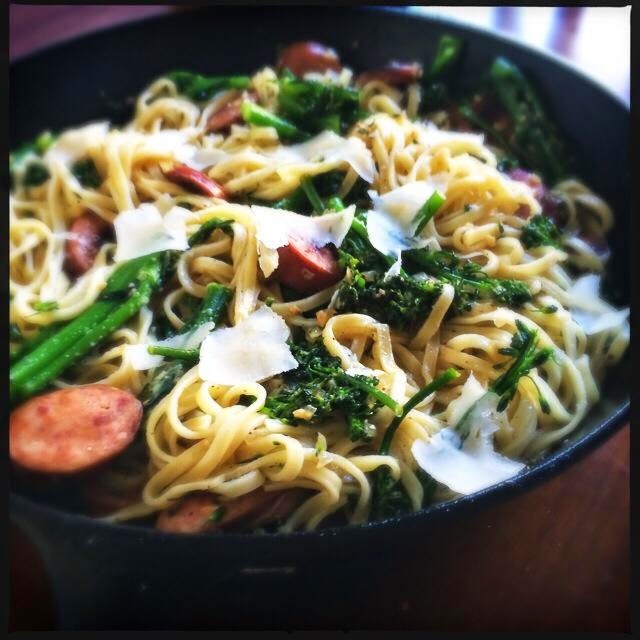 Yes, the same pot you blanched the broccolini in. Since this was fresh, it only took about 4 minutes. I decided I would like a little heat in this dish, so I added a some cayenne. Of course, you do not have to add this. It will be delicious either way! When your pasta is finished, add the pasta to the pan. I like to use fresh here. Toss and top with a little shaved parmesan. However, this dish can easily, and inexpensively I might add, me made using basic broccoli and ingredients from your local grocer! This is a perfect example of going into your favorite store and just being inspired by what they have on hand, and coming come to create a simple, yet flavorful, dish for your family! So get inspired tonight and COOK! Bring a pot of water to a rolling boil and add salt. Add broccolini to water and allow to cook 2-3 minutes. Remove from water (DO NOT EMPTY WATER), and add to a bowl of ice water. Add oil and Polish Sausage to skillet. To the pot of boiling water add pasta and cook according to the directions on the box. In skillet, add onions and cook until soft and translucent. Add garlic, and cook until you smell it coming from the pan. Return sausage to the skillet. Toss and top with shavings of parmesan cheese. Such a great dish. I love combining polish sausages with vegetables, so how long will this dish last in refrigerator? Hey Lita! Thanks for stopping by! To be honest, we didn't have a lot left of it. I remember eating it for lunch the next day and it was fine, but I can't say if it would last a week or not.